Yikes, three blue printed makes in quick succession? At least this is a different kind of garment! You might have noticed a distinct lack of skirts from me until now. I’m not really sure why that is, as I wear skirts pretty often and have a few RTW ones in regular rotation. I suppose maybe it’s because I don’t see many skirt patterns that particularly inspire me, and I’m quite particular about waistband level and flare amount on my skirts. 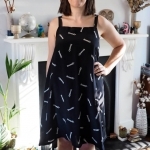 It’s something I’m keen to put right now though, and this awesome little pattern is a good kick-start to some skirty sewing. This is the Liesl & Co Everyday Skirt. 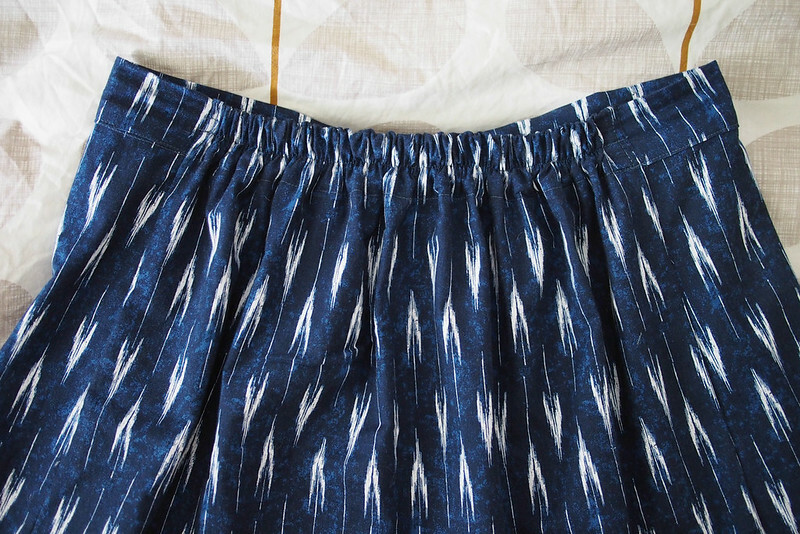 I was tempted to go the self-draft route for my dream skirt, but this pattern is basically it: flat side panels for hip-skimming effect, pockets tucked into in a front-shifted seam and a flat-fronted waist with just the back elasticated. There are some very cute versions of it in the blogosphere which sealed the deal: Kelly, youandmie, Fa Sew La. The PDF pattern is really good – unusually, you cut the pieces out first, before sticking together. This saves both paper and tape – the printout is only 20 pages. Top marks for that, Liesl! I didn’t bother with a toile as it’s elasticated at the waist, and cut straight into my lovely Michael Miller ikat print, which I bought a while ago on Fabric.com. It’s a quilting cotton, but good quality and with a little stretch/give which makes it very comfy to wear. Making the skirt up was really fun and the instructions are great. 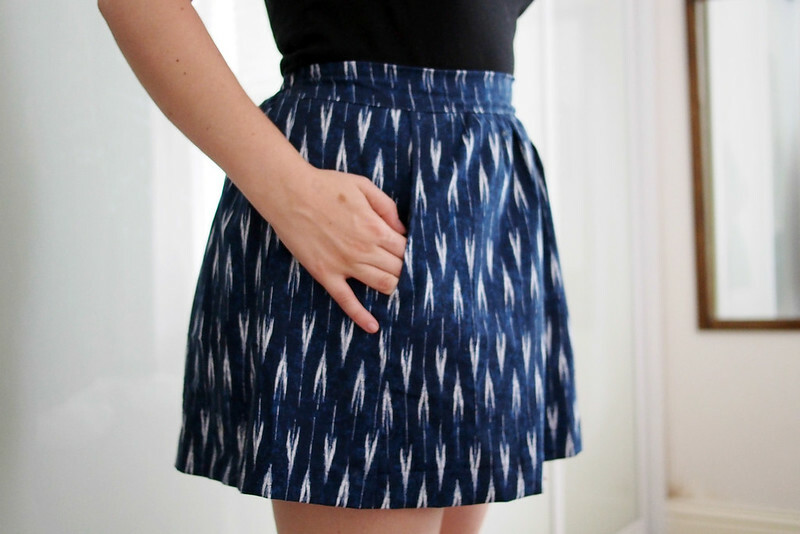 It’s got a particularly good way to add the faced front waistband – you sew it to the wrong side of the skirt first, then fold it over to the right side with the seam allowance tucked under and topstitch. This is the opposite way to how waistbands usually go on, but it makes way more sense, giving a cleaner and more accurate finish since you don’t need to stitch ‘blind’ from the RS to catch the loose folded edge underneath. I’ll be adding it to my list of go-to techniques. I got a little bit confused about how to finish the last side seam with the elastic enclosed, but just ended up catching it in the side seam which seems fine. The pattern recommends sewing two channels and using thinner elastic, but I just went for one piece of wide elastic (as I recently bought a whole reel in bulk), topstitched down the middle so it doesn’t twist. Even though I sized down to a small, the skirt ended up a bit too big so I had to pull the elastic quite tightly at the back. This gives me a bit of bunching at the back and also pulls the side seams backward, but it’s not toooo noticeable because I matched up the pattern pretty well. Next time I’ll reduce the width of both the front and back pieces by an inch or so. I also probably cut it a shade too short since I like it near my natural waist, oops. GRATUITOUS POCKET CLOSE UP. It’s a good pocket, perfect size and position. Tidy guts, all allowances overlocked, except I just missed catching all the pocket tops in the waistband. 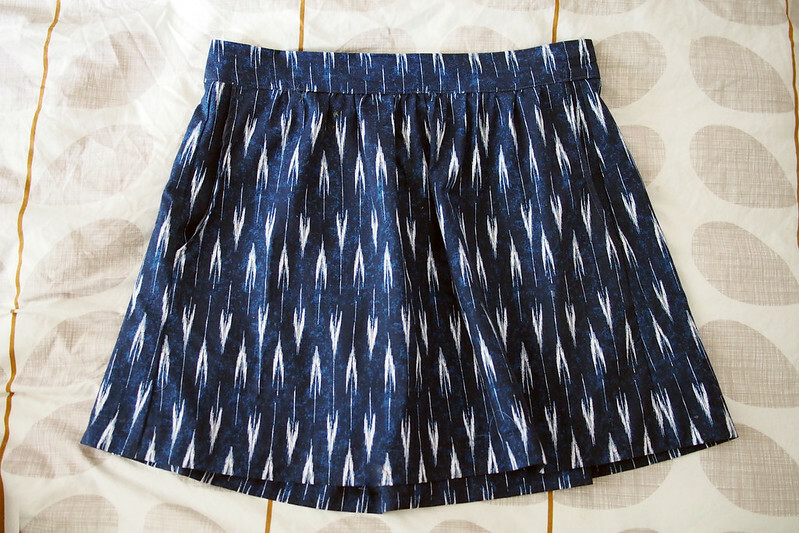 I’m really happy with this pattern: I need more skirts in both prints and solids so once I’ve tweaked the fit I think this’ll be a TNT for me. 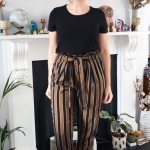 I can imagine it’d be great in loads of fabrics, from chambray to floppy viscose – even a ponte knit perhaps – and will transition well into cooler weather with tights. 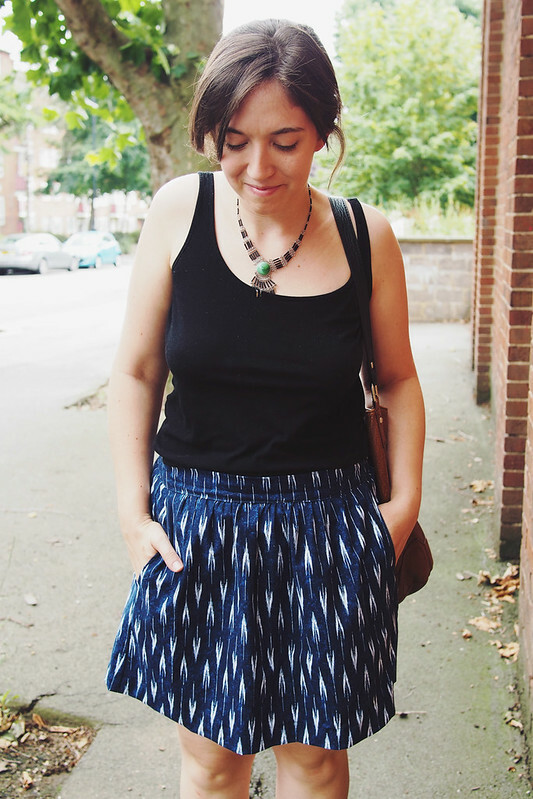 Truly an everyday skirt! I love your everyday skirt katie! 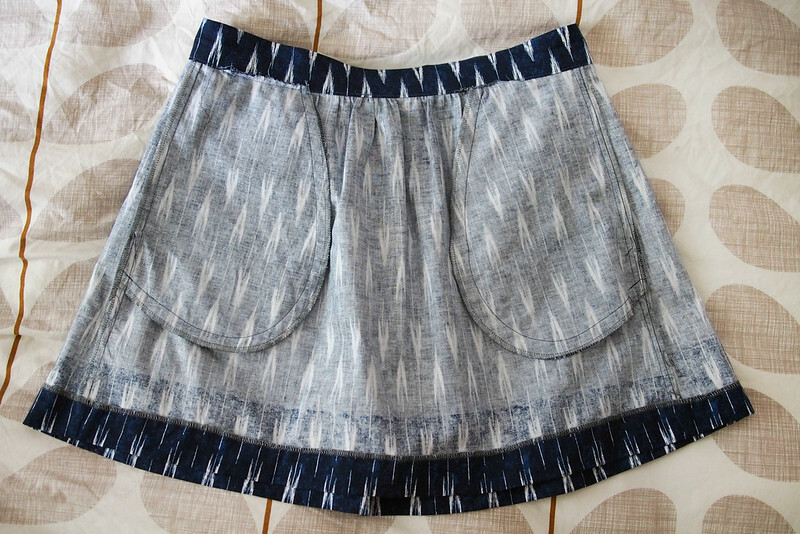 I do LOVE a great pocket and the ikat print is devine. 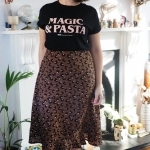 I have just finished making a skirt with pockets (yet to be blogged) but with a zip and I can see how this could be a fab go-to pattern for a quick sew and it doesn’t seem to take up a lot of fabric so maybe a spurge fabric make?! I was supposed to say *splurge* fabric…. doh! Looks great and not too much gathery pouffe which is my issue with gathered skirts! I love the navy and black together. It’s a very you skirt! Ah, really sweet skirt. The fabric print is perfect! I can see why you’ll be making another, this is lovely. I do love an elasticeted waist so very comfy. I love your version of this skirt. That ikat fabric is really cool! It looks great on you Katie. 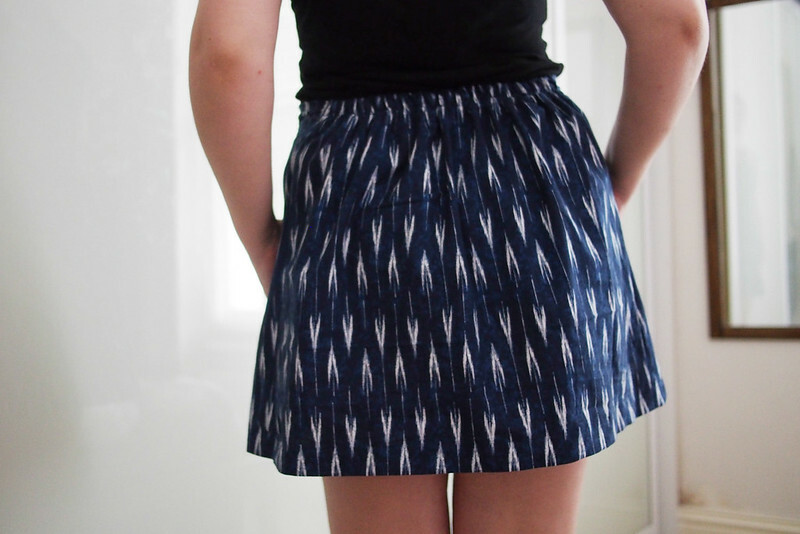 You should definitely make more skirts! 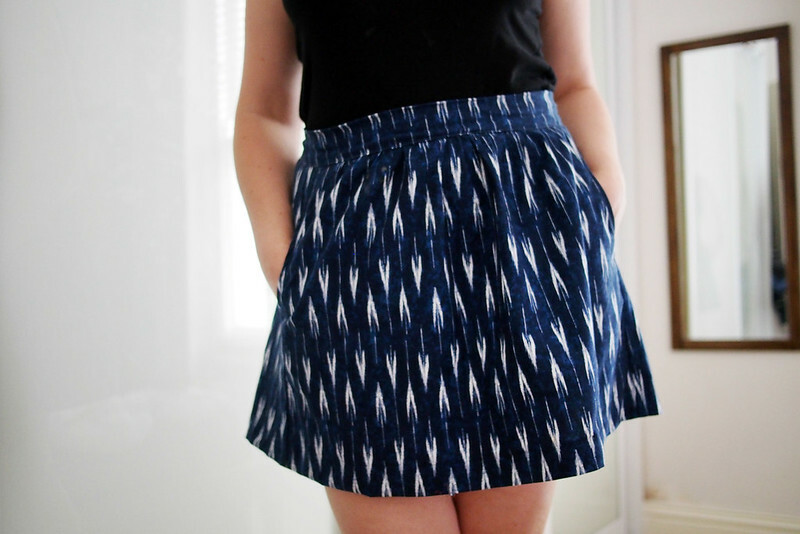 Great skirt, I love the fabric! I have sewn from a lot of Oliver & S patterns and the instructions and pattern drafting are always really good, looks like it’s time I sewed from Liesl’s big patterns too! Very nice! 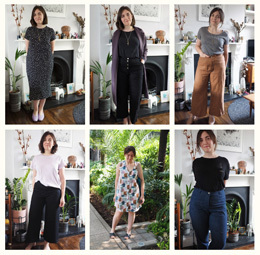 I really love your fabric choices – pretty much what I would choose for RTW clothes (but when picking sewing fabric I always end up with bright florals!). Really cute skirt! I had the same issue with this skirt – a bit too much poofiness in the back. I’m definitely planning another try and agree that removing some fabric from the front & back panels should help. Looking forward to hearing how the pattern mods improve your next one! That print… Wow. Great day skirt.